WASHINGTON — Housing Secretary Ben Carson pledged Tuesday to “work toward a time when no family is without a home” — even as the Trump administration seeks sharp budget cuts that critics say would lead to more people living on the streets. 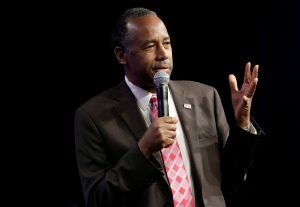 “A man will not beat addiction from a gutter, he will not get psychiatric help underneath a bridge, and he will not find a steady job without a steady address,” Carson said, to applause from a packed ballroom at a conference organized by the National Alliance to End Homelessness. Spokesman Raffi Williams said Carson will make homelessness a top priority at the Department of Housing and Urban Development. Trump’s budget for fiscal year 2018 calls for cutting about $7 billion from the $48 billion HUD budget, including homeless assistance grants and a reduction of nearly $1 billion to Section 8 rental assistance, which helps about 2.2 million low-income families afford housing. Carson, a conservative Republican who challenged President Donald Trump for the GOP nomination last year, spoke as Congress considers Trump’s budget for fiscal year 2018 — a plan that calls for cutting about $7 billion from the $48 billion HUD budget. That includes cuts to homeless assistance grants and a reduction of nearly $1 billion to Section 8 rental assistance, which helps about 2.2 million low-income families afford housing. The Trump budget also would eliminate funding for the U.S. Interagency Council on Homelessness. While promising to fight homelessness, Carson drew on his own experience as a doctor to suggest that government assistance shouldn’t become a way of life, either — an analogy that drew heckles from one woman in the audience. Carson said doctors don’t let people with curable diseases sit in hospitals after months, or years. “They’re not doing their job. In the same way, we cannot be satisfied to throw resources at services that merely subsidize homelessness. We need to cure it … and find a permanent home, and permanent healing,” Carson said. “It doesn’t work that way,” shouted one woman, briefly interrupting Carson. She later declined to be interviewed by the AP. Another woman at the conference, Elaine Williams of Richmond, Virginia, said she was pleased to hear Carson was making homelessness a priority. Williams, 23, grew up poor like Carson, and at times had no permanent roof over her head, living with friends as a teenager. “I believe he said things that he wants to deliver on, but I’ll have to see it to believe it,” Williams said after Carson’s remarks. Williams is a co-policy chair at Advocates for Richmond Youth, a nonprofit that works to end youth homelessness in the Virginia city. Nationally, homelessness has been on the decline in recent years. According to government estimates, there were about 550,000 people who experienced homelessness on a single night in 2016 — a decline of 14 percent since 2010. Left: Secretary of Housing and Urban Development Ben Carson pledged Tuesday to "work toward a time when no family is without a home" — even as the Trump administration seeks sharp budget cuts. Photo by Joshua Roberts/Reuters.